Meriwether Lewis, President Jefferson's personal secretary, left Washington DC on March 15, 1803. His mission was to prepare himself, then led an expedition team into a vast unknown land called Louisiana Territory. 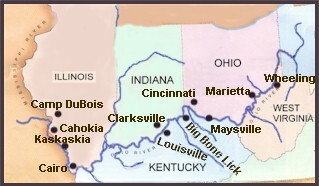 This trail of discovery became known as the Eastern Legacy. March 15, 1803: Leaving Washington DC, Lewis traveled via horseback (route in gold) through the eastern towns preparing himself for the western expedition. Lewis attended crash courses on botany, paleontology, navigation and field medicine. Purchased guns, tomahawks and knives and sent an invitation to William Clark to co-command the expedition. June 10, 1803: A Conestoga wagon loaded to capacity with 3500 pounds of supplies and equipment destined for the western expedition left Philadelphia. 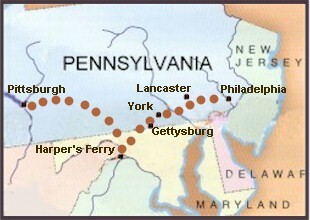 At a rate of ten to twelve miles a day it traveled through the towns of Lancaster, York, Gettysburg and arrived at Harper's Ferry on June 28. 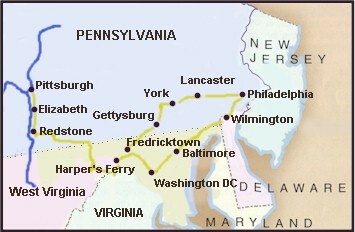 Crossing the Appalachian Mountains the Conestoga wagon arrived at Pittsburgh on July 22.